Hot on the heels of Brexit comes the Chilcot report on the serious moral failures of UK government. Dr Alison Broinowksi, currently in London, asks what Chilcot's findings mean for Australia's unblinkered alliance with the U.S. THERE IS a sense in Britain that its very foundations are shaking. Just weeks since the Brexit decision, the prospect of recession is real, the value of the pound and the price of real estate have dropped out of sight, credible leaders are lacking, and uncertainty threatens the future of Great Britain itself. Piled on top, now, is the Chilcot report on the war in Iraq. Its revelations about the moral failures of government in the UK are so serious that some feel they could bring the whole edifice crashing down. Cynics expected Sir John Chilcot to produce the fifth in a series of British whitewash reports relating to the war. Three inquiries had already dealt with secret intelligence and one with the “suicide” of an Iraq weapons inspector, Dr David Kelly. But Chilcot has surprised commentators by not letting his past role as the senior official responsible for Northern Ireland, where Tony Blair’s early triumph gained him a reputation as a peace-maker, get in the way of polite but pointed conclusions about the Iraq war, sprayed at top people at MI6 and Blair in particular. and he could have identified the prospect of a resurgent Iran and the rise of Islamic State because he was warned of both before the invasion. We now know what many suspected, that Blair gave the U.S. President a unilateral undertaking in April 2002 that Britain would join the U.S. in attacking Iraq and that in July, eight months in advance of the war, he wrote to Bush ‘I’ll be with you, whatever’ (as reported in yesterday’s The Age editorial). The palpable disgust of many in England is less about whether Blair really is a liar, or has merely misled them and the Parliament — it is more the confirmation that he was a sycophantic lapdog of one of the worst presidents America has had. Worse, Blair still insists that he made the right decision and that "the world is a better place right now". Blair’s capacity to believe what suits him seems boundless. Appearing close to tears on Wednesday as he acknowledged the loss of British lives, he still refused to agree that their sacrifice was in vain. His eyes may water again if the bereaved families succeed in their lawsuit against him for sending their relatives to war with inadequate protective gear. After his retirement from politics, Blair became a UN envoy to the Middle East – of all things – yet he chose before invading Iraq to put the U.S. ahead of the UN and he actively undermined the authority of the UN Security Council in doing so. Blair still seeks the credit for bestowing new opportunities on the hapless Iraqis. He and his Australian ally evidently conspired to take the same line on invading Iraq, for John Howard too has said he would do it all again in the same circumstances. Neither of them will apologise for their errors, instead shifting the blame onto the intelligence agencies. But Chilcot shows the intelligence the two prime ministers were given was mainly accurate and timely — it was their use of it that was selective. Australia gets minimal attention in his report and for good reason. Howard unquestioningly committed Australian troops, as usual since World War II, to yet another American war. Both he and Blair behaved like George Bush’s poodles. Successive Australian leaders have refused to set up an inquiry like Chilcot’s. That means it could happen again. Indeed, in the seven years it has taken for Chilcot to report, it is happening again. David Cameron’s government has attacked Libya, Iraq and Syria, and Australia has redeployed in Iraq and bombed Syria. Now, with Cameron gone, the proper British response to Chilcot would be to pull out the troops and change Britain’s way of going to war. If popular support builds in Britain for reform of the war powers to prevent a prime minister virtually alone being able to dispatch armed forces, Australia may at last be forced to do the same. The peculiar personality of Blair, the Catholic convert, who surprised a U.S. authority on Saddam Hussein by asking “Isn’t he evil?” hovers over Chilcot’s report. 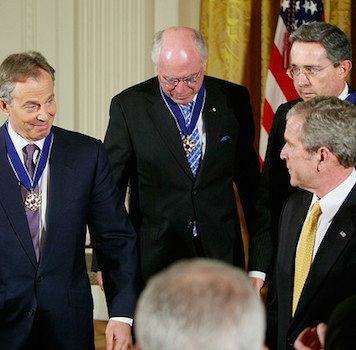 Hidden from view is his friend George W. Bush, whose replies to Blair’s 29 personal notes in the months before the war were not released for publication by Washington. So we have Chilcot, but we still don’t have an Australian report, nor do we know all of what passed between Bush and Blair, or anything between Bush, Blair and Howard. We need to know. And we still have the war. Dr Alison Broinowski is vice-president of Australians for War Powers Reform and vice-president of Honest History. A shorter version will be in John Menadue's Pearls & Irritations. Chilcot Report, exposes ex-Pm John Howard as " the patsy from Down Under"